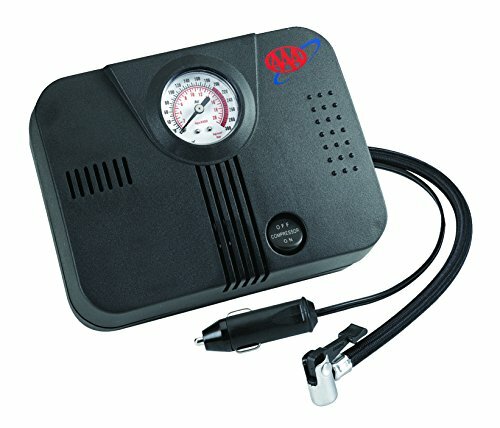 AAA Quality: Inflate a standard spare car tire in 8 minutes with this AAA 300 PSI portable tire inflator. Featuring a heavy duty and powerful motor, this compressor is one of the essential automotive accessories for a car, pickup truck, van and SUV. Can also be used for an ATV or motorcycle tire when using a converter. Convenience: Simply plug the DC power cable into your cigarette lighter socket, attach the quick connect air hose to your tire and turn the compressor on. Watch the built in easy to read pressure gauge as you inflate the tire to the desired PSI. Versatility: Using the included nozzle adapters, this air compressor can be used for a bike tire, basketball, volleyball, football, inflatable pool toy's and other inflatables such as an air bed or mattress. Peace of Mind: This air compressor is essential to keep in your vehicle in case of an emergency or disaster when on the road along with various other tools and gadgets. If you have any questions about this product by AAA, contact us by completing and submitting the form below. If you are looking for a specif part number, please include it with your message.